The first thing that would come to your mind when you read FIRE is the mental image of woods burning into flames. What else could fire mean? Right? I don’t know about you but I would say A LOT OF OTHER THINGS. No word can have a single meaning attached to it. This is rather amazing, but at times, it’s confusing as hell. It’s better to explore the possibilities of using a single word in different situations and steer clear of all the confusion. आइये आज सीखते हैं FIRE शब्द के अलग-अलग context में different meanings. • By the time we reached, the fire had gone out of control. • I can see that he has a fire to fulfill his dream. • She had an amazing fire in her eyes. • The police opened fire on the agitated protestors. • The opposition leader has a habit of directing his fires against the policies of the current government. • The policeman fired a shot at the thief. • Nancy fired angry letters to all her employees regarding their loose attitude in the office. • The lawyer fired the accused with questions and trapped him in his own lies. • I can’t believe that he got fired for such a small mistake. • She can’t take criticism at all; it fires her up in a moment. • Your inspiring words have fired a new ray of hope in me. So next time, push back the mental image and explore the new ways in which you can use a single word. 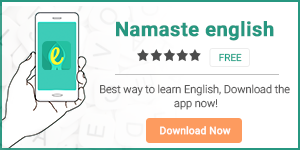 Don’t forget to download our apps HinKhoj and Namaste English.